If you’ve been shopping lately, especially in the craft stores, you are feeling the pressure of the holidays descending before we know it! Labor Day weekend is already a summer memory and things are in full swing for fall. 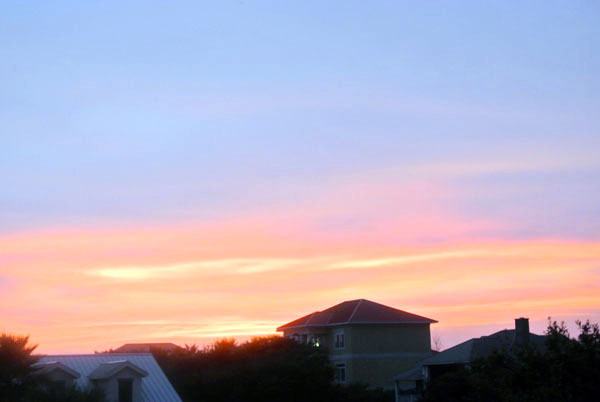 Sunset in Orange Beach on Labor Day evening….sigh…..Time to get back to reality! 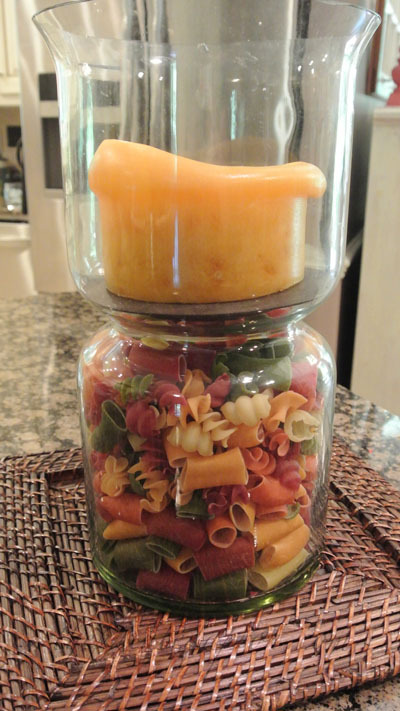 This hurricane was full of seashells and a white candle, but now it is full of large veggie pasta shapes and a butterscotch pillar. 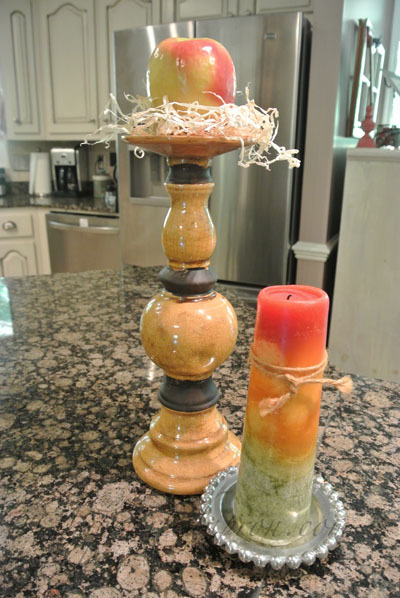 Don’t have a hurricane candle? 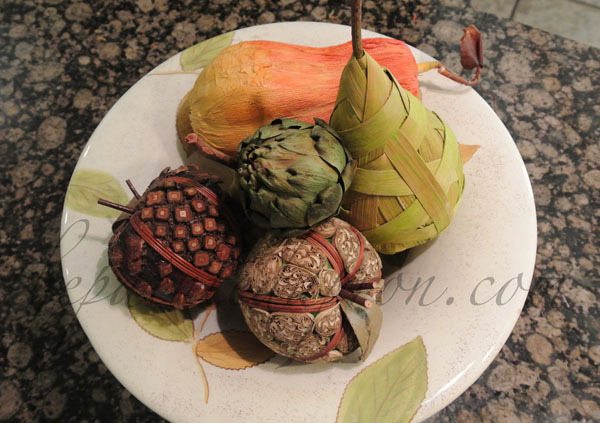 You could use a vase and fill it with dried beans or popcorn, potpourri, wine corks, autumn fruits or dried flowers~just look around and in your pantry, you might have just the thing! 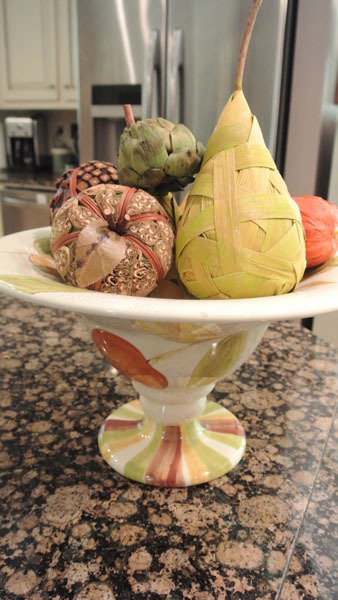 A compote with muted earthy colors holds some faux apples, pears, and an artichoke. 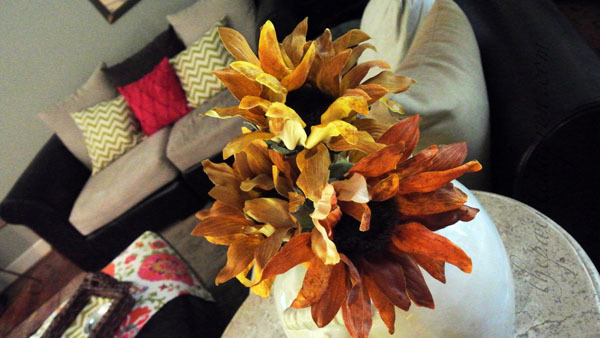 The key to fall decor is color and texture~look outside for elements too. Dried hydrangeas look great this time of year. 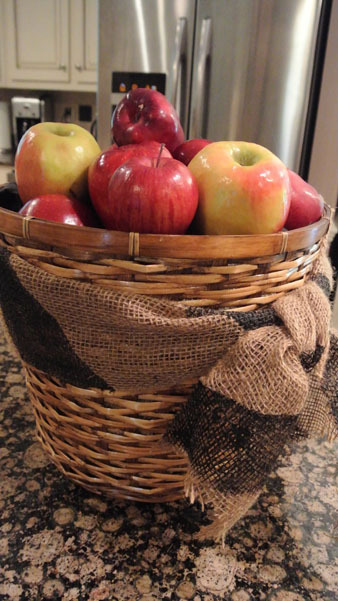 This burlap ribbon basket usually holds hand towels in the master bathroom, but doesn’t it look great holding apples? 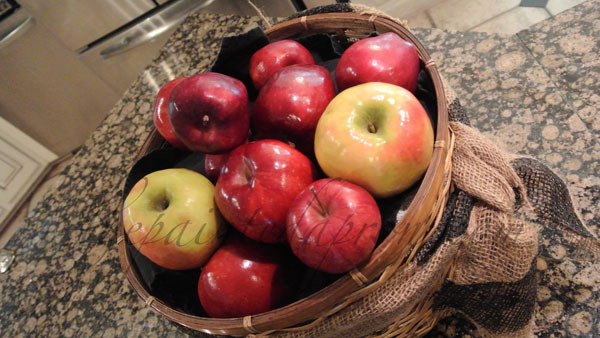 I left most of the towels in the basket and covered them with a black cloth napkin so the apples are elevated. Doesn’t it look like a bushel full? 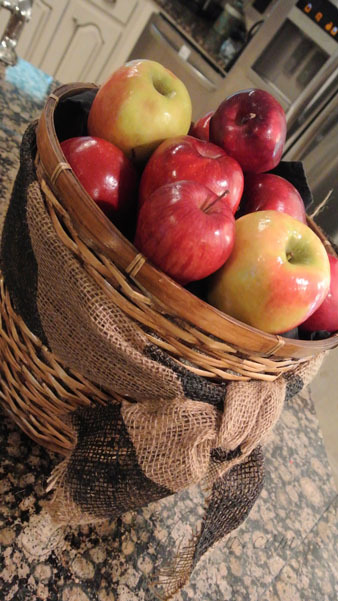 Burlap ribbon is a great way to bring the Fall in fast! 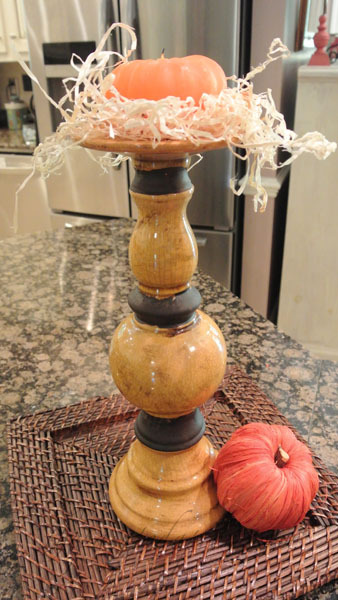 Or, turn something upside down and make it a pedestal! 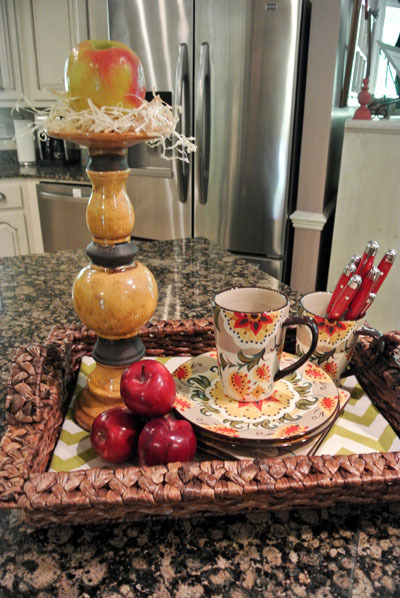 A basket or tray full of seasonal items is an easy way to decorate, and functional too! A sign of course makes everything abundantly clear! 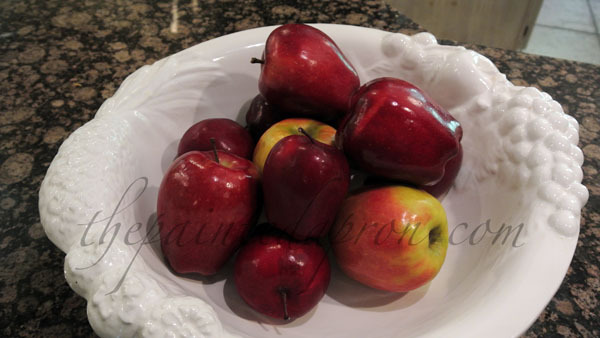 How about a glass of apple cider? I love your vignettes. We live in South Carolina and our temps are far from feeling like fall so I have yet to start the fall changes here but, your little groupings have definitely stirred something in me to start… Thanks for sharing… I found you through Vintage Chic and am now following on Bloglovin…. Thanks Cathy! I am so happy to know that you got some ideas!! All of these fall colors coming about make my heart happy 🙂 Such cute decorations, as always! 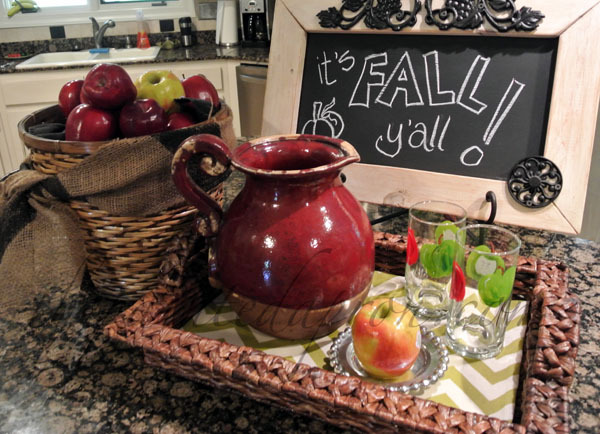 Oh I love all of this early fall decorating! And like ya’ll, it can sometimes be hard to do — we still are having 100 degree days. I too am all about the “shopping the house” concept, love to re-purpose items for different decorating needs. 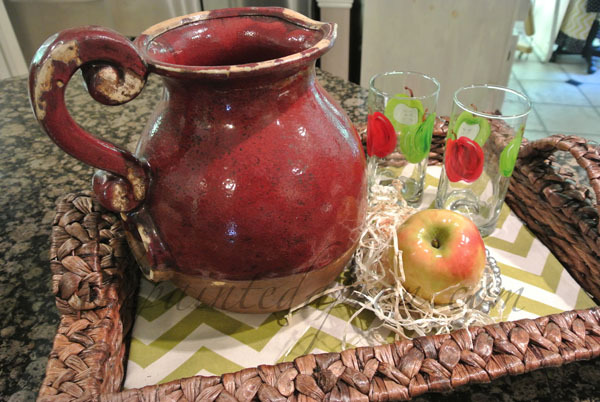 Also, I am absolutely in love with that dark red pitcher!!!! 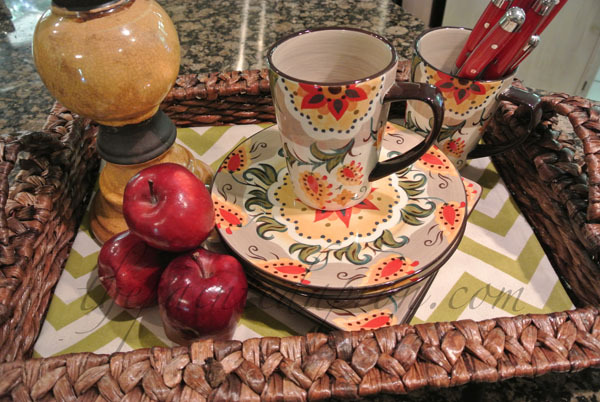 All your Fall accents are so easy and pretty! Please, please share these ideas over at Stylish Friday Finds! My readers would love it! Thanks Karen, I will link up next week! I’m SO ready for fall Jenna! It was beautiful today here with lower humidity and only 80 degrees. My perfect fall day is a low in the 50s and a high of 70. 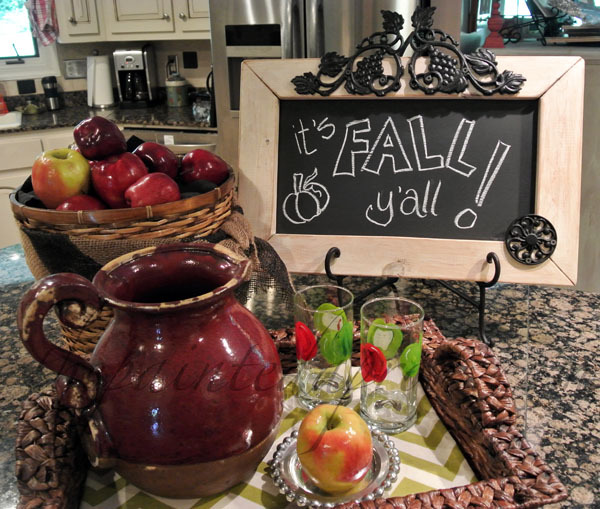 I’m afraid I have about 6 weeks for that to be a reality 🙂 Love your early decorating touches and your cute chalkboard tray vignette! Still 90 here, aghhhhh….I bet it was beautiful on your lake! I want to go back to the beach next weekend but I have been vetoed because it’s a big Ala game…I might just go by myself 🙂 if it’s going to be hot I want to swim! Have a lovely Sunday, and thanks for all the really sweet comments. I will have withdrawls from the Novel Bakers next week! Loads of great ideas! 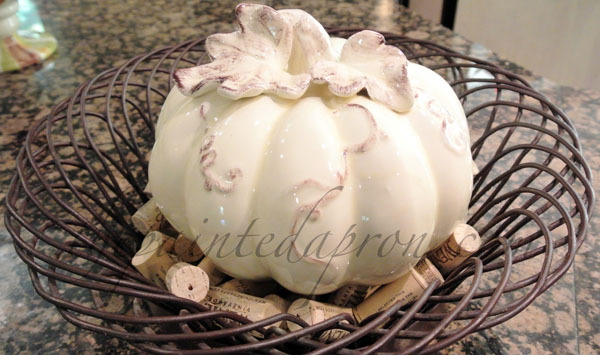 I love that ceramic pumpkin and thanks for sharing where you bought it! The handmade feel to it is so charming. I will say, that even though the stores are pushing the season, at least they are offering them at 40-50% off! 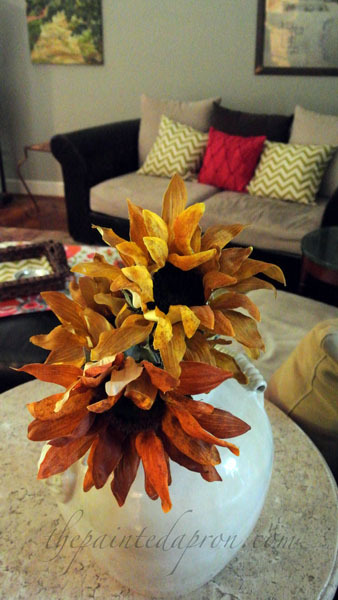 I just made a new fall wreath for the front door all at discount prices. Takes the edge off of how much supplies cost.. they do add up, don’t they?! 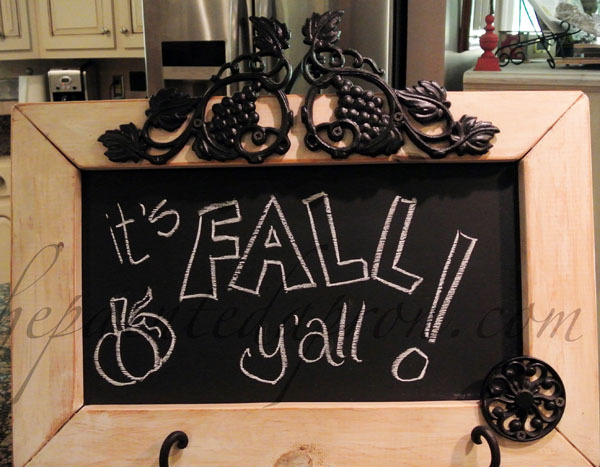 I love your fall decorating! I particularly like the pitcher and that tray. 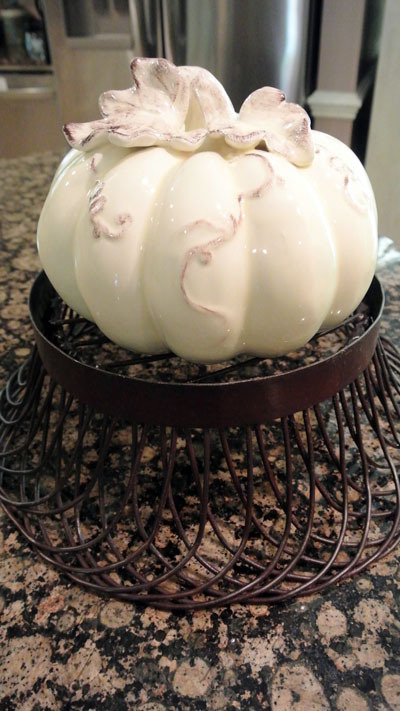 Thanks for such great eye candy, and a nudge to get going with my own fall updates.